Terumo BCT said today it has joined the public-private European consortium seeking to establish standard protocols and clinical validation for blood-based cancer biomarkers. The consortium, CANCER-ID, will use Terumo BCT's Spectra Optia® Apheresis System in its research efforts aimed at assessing diagnostic leukapheresis (DLA) toward the capture and harvesting of larger numbers of circulating tumor cells. CANCER-ID's initial evaluation phase will be followed by a clinical phase, running until 2020, with a goal of establishing the use of liquid biopsies in evaluating the progress of lung and breast cancer treatments. The research may identify a role for Spectra Optia in future diagnostic processes, Terumo BCT added. Spectra Optia is an FDA-cleared and CE marked device used by hospitals and apheresis centers worldwide in therapeutic apheresis and cell collection procedures. 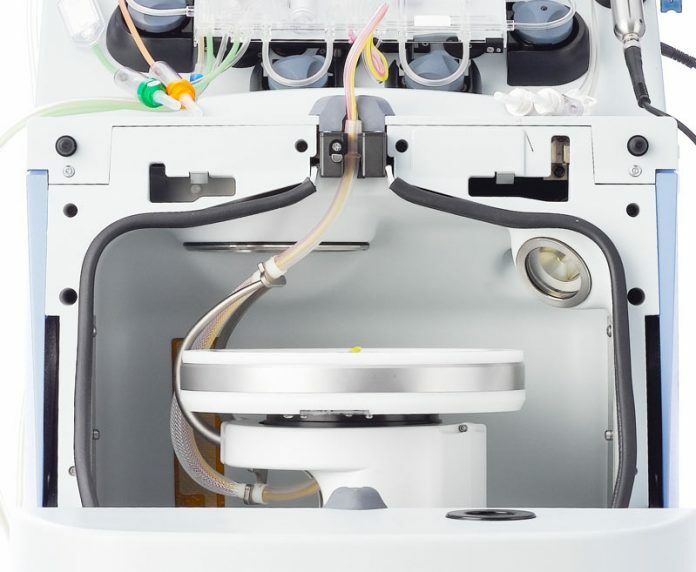 The system uses continuous-flow centrifugation and optical detection technology, which according to Terumo BCT provides operators with the ability to perform a wide variety of apheresis procedures on a single platform. CANCER-ID is a consortium of 38 partners from 13 countries working to establish the clinical utility of liquid biopsies. Partners include experts from academic and clinical research, innovative small-to-medium sized enterprises (SMEs), diagnostics companies and the pharmaceutical industry. Lead companies of the CANCER-ID consortium are Bayer HealthCare and Silicon Biosystems, A Menarini Group Company. The consortium is funded by the Innovative Medicines Initiative (IMI), a public-private partnership of the European Union and the European pharmaceutical industry, represented by the European Federation of Pharmaceutical Industries and Associations (EFPIA). The CANCER-ID project has received funding from the Innovative Medicines Initiative 2 Joint Undertaking under grant agreement No 115749. The IMI contributed €6.62 million ($7.4 million) toward the €16.7 million ($18.7 million) project, with EFPIA offering nearly €7.6 million (about $8.5 million) in in-kind support, and €2.5 million ($2.8 million) coming from other sources. “As a partner to the consortium, we further our commitment to research and innovation that advances personalized medicine with a specific focus on immuno-oncology,” Monte Smith, Terumo BCT’s vp, global therapeutic systems, said in a statement. Last month, Spectra Optia received the CE mark, making it the first and only device in the European market approved to treat Guillain-Barré syndrome (GBS) and myasthenia gravis (MG) using therapeutic plasma exchange.